By Russ Horton, Reference Archivist. One hundred years ago today, President Woodrow Wilson ordered the mobilization of the Wisconsin National Guard for military service. However, he did not send them to Europe, where a World War raged. Instead, he sent them to Texas to protect our border. While their service during this time did not involve pitched battles or high casualties, these men answered the call to duty and did what was asked of them. What’s more, many would go on to fight in the trenches of World War I. For these reasons, we remember their service on its 100th anniversary. 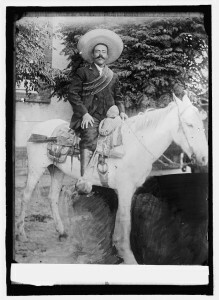 When the United States officially recognized Venustiano Carranza as the president of Mexico in 1915, it angered Mexican revolutionary Pancho Villa, who began striking out against Americans in a series of escalating events. On March 9, 1916, Villa and his men attacked Columbus, New Mexico and the nearby Army post Camp Furlong, killing several American civilians and soldiers. The next day, President Wilson released a statement that US military forces would pursue and capture Villa. On March 15, General John J. Pershing received orders to lead federal troops into Mexico without the permission of the Mexican government. As they proceeded further into the country, political tensions rose and Carranza threatened military action of his own. War with Mexico seemed close and raids into the United States grew in number. In May, Wilson mobilized the Arizona, New Mexico, and Texas National Guards to augment the federal troops, and one month later called the remaining states’ National Guards into federal service. Roughly 4,000 Wisconsin National Guard troops reported to Camp Douglas on June 22. Between June 27 and June 30, six units were mustered into federal service: Troop A of the 1st Wisconsin Cavalry; Battery A of the 1st Wisconsin Field Artillery, the 1st, 2nd, and 3rdWisconsin Infantry Regiments, and Field Hospital #1. Troop B of the 1st Wisconsin Cavalry mustered into service about a month later, on July 24. The first Wisconsin units, Troop A and Battery A, left their home soil on July 1 and arrived at Camp Wilson, Texas four days later. Located just outside of San Antonio, near the grounds of Fort Sam Houston, Camp Wilson was named after the sitting President and would be home to all of the Wisconsin units during their service. The remaining Wisconsin units arrived shortly thereafter and the men began a strenuous regimen of training and drilling in the heat of a Texas summer. The Wisconsin troops left Camp Wilson on August 7, carrying out a two day hike to Leon Springs for target practice with live ammunition. On August 18, the night before they began their march back to Camp Wilson, a Category 4 hurricane, that had hit Corpus Christi before heading inland, struck their camp while the men slept. Almost every tent in the camp was blown down but no serious injuries were sustained. The units commenced their march in the pouring rain and arrived at Camp Wilson exhausted and completely drenched. The following month, while on an 80 mile march to Austin, the Wisconsin troops took part in a simulated battle. On September 18, the roughly 4,000 Wisconsin National Guardsmen defended the city of New Braunfels against 10,000 Guardsmen from other states and held off the superior force for the better part of a day. Soldiers on both sides fired over 80,000 rounds of blank ammunition during the exercise. The mock battle and long march gave the men valuable experience in organization, fighting, and supplying men in the field. Soon after, the United States began reducing its military presence on the border. Troop A and Battery A returned to Camp Douglas to be mustered out of federal service in October. Troop B remained behind, and while patrolling on October 27, caught 50 National Guardsmen trespassing in some private pecan groves near Salado Creek. The men were arrested and either fined or sentenced to labor for trespassing and for disobeying a direct order to stay off of private property. November 1916 brought a presidential election in which Woodrow Wilson sought re-election against Supreme Court Justice Charles Evans Hughes. In a very close election, 2,600 Wisconsin soldiers cast ballots from the field, the largest turnout among the various states’ National Guards. Following the election, the men stationed in the San Antonio area turned their attention to another American tradition—football. Sixteen teams created from federal units and National Guard units from Wisconsin, West Virginia, Texas, Mississippi, Illinois, Virginia and more played games in November and December as part of a massive tournament. While all of the Wisconsin teams did well, the 1st Wisconsin Infantry team made it all the way to the championship game. On Christmas Day, they defeated the 3rd Illinois Infantry 9-0 to claim the 12th Division trophy. Two days later, the men of the 1st Wisconsin boarded a train to begin their trip home. Unlike Troop A and Battery A, who mustered out at Camp Douglas, the remaining Wisconsin troops stopped first at Fort Sheridan, Illinois to be mustered out of federal service before returning to their home state. The 3rd Wisconsin Infantry had completed their service in December; the 1st Wisconsin Infantry and Field Hospital #1 were mustered out in January 1916; the 2nd Wisconsin Infantry in February; and Troop B of the 1st Wisconsin Cavalry were the last of the Wisconsin soldiers to leave active duty, mustering out of service at Fort Sheridan on March 6, 1916. While the Wisconsin troops did not have much of an opportunity to utilize their training during the Mexican Expedition, their service was far from in vain. Mere months after they returned to Wisconsin, the United States declared war on Germany, and many of those Wisconsin National Guardsmen were called into service as part of the newly formed 32nd Division. On the battlefields of France, the training and drills performed at hot, dusty Camp Wilson, Texas paid huge dividends as the 32nd Division proved itself to be one of the finest in the entire American Expeditionary Forces.